Here’s what’s up in the world of TV for Tuesday, May 21. All times are Eastern. Grimm (NBC, 10 p.m.): This supernatural procedural looked poised to have a breakout year at the start of the 2012-13 TV season, but in light of irregular scheduling, an oddly early start, and the meteoric rise (and semi-stumble) of Revolution, the Grimm train might have lost some steam. 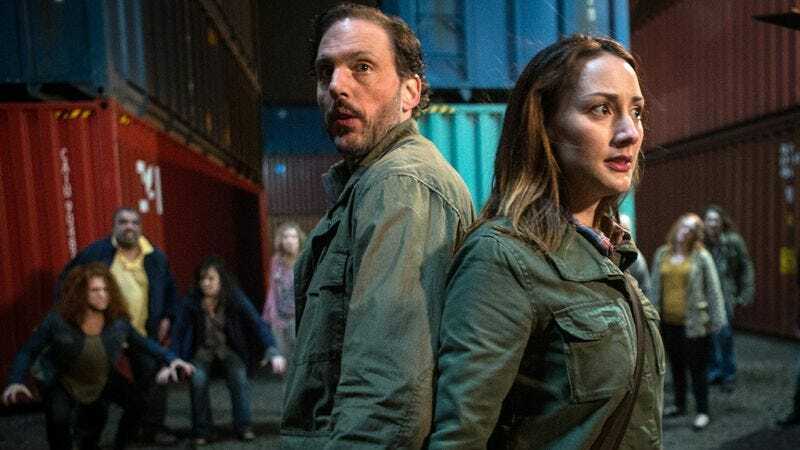 After careful consideration of topics that are both huge on TV and poised to have a big summer at the box office, the show looks to regain its footing with the hottest thing going in genre fiction: Zombies! Well, “the ‘undead’,” technically, but Kevin McFarland isn’t here to split long, gross, didn’t-stop-growing-in-death zombie hairs. Awkward. (MTV, 10 p.m.): “Jenna recalls bad memories while attending a dance” reads the TV Guide synopsis, and Myles McNutt can’t help but sympathize. Rumors of “The Great McNutt Electric Slide Disaster” ripple through the high-school halls of Nova Scotia to this day. The Shield (11 a.m.): High-stakes cases abound on this week’s episode: a campus heroin epidemic, a missing Alzheimer’s patient, mass murder at a women’s shelter, and… a stolen bike. Look, you don’t need Brandon Nowalk’s copy of Bicycle Thieves to know the last item on that list is A Big Deal. The Ghost Army (PBS, 8 p.m.): During World War II, the men of the 23rd Headquarters Special Troops confounded Axis forces through the use of inflatable tanks, sound effects, and other battlefield ruses. This is their story—unless the documentary itself is some sort of ruse. Man-Eating Super Squid (Animal Planet, 9 p.m.): Not to be confused with Man Eating Super Squid, the somehow less hyperbolic portrait of one voracious appetite and the only mollusk that could satisfy it. Dancing With The Stars (ABC, 9 p.m.): Kellie Pickler could only notch a sixth-place finish on American Idol, but she’s the odds on favorite to win the 16th season of DWTS. Could a Celebrity Apprentice appearance/win be far behind? When will Pickler finally fill the hole Simon Cowell left in her heart (before Simon Fuller filled part of it up with a record contract and lots of money)? I’m Married To A… (VH1, 10 p.m.): At press time, some sources still list this episode as a “TBA”—as in I’m Married To A… Well, I’m Not Truly Sure What I’m Married To—Let Me Get Back To You On That. Moonrise Kingdom (HBO, 7 p.m.): There are usually one or two child characters in every Wes Anderson movie, but as the filmmaker’s 2012 effort demonstrated, that number should be increased exponentially—because if there’s any skill set attuned to the peculiarities of an Anderson script, it’s the stilted offerings of developing performers. NBA Playoff: Game 2: Grizzlies at Spurs (ESPN, 9 p.m.): As written, the matchup for this lineup is only slightly scarier than the Wild West scenario of a potential team-up: Grizzlies with Spurs. Mel Brooks: Make A Noise: How ’bout this? Or this? Or maybe this one? If Phil Dyess-Nugent knows his Mel Brooks (and the review of this American Masters special indicates he does) he thinks all of these are the noises Brooks is looking for.